Artist Kazim Rashid’s short film ‘2001: Pressure Makes Diamonds’ operates as both an online video hosted by Boiler Room’s 4:3 platform, as well as part of a group exhibition at the Rich Mix focused on Asian identity and culture post-9/11. Billed as a ‘tri-narrative film’, it weaves between 9/11 and the War on Terror, the Oldham riots, and the demise of boxer Prince Naseem to highlight the dearth of prominent Asian culture in a British frame. A tight soundscape threads through the work illustrating the importance of music in presenting a social history. The film form is grid-like, running three screens across and three screens down, giving a sense of a reinterpreted news channel. At stake is a tension between the immediate spectacle of TV news, and the continued mournful trauma of racism and colonialism. There is a breakdown in genre as the news item is turned into a sport spectacle, and a boxing match into a bloody war. Rashid’s aesthetic sense is rooted in a social understanding of Asian presence in Britain. Which brings me to the soundtrack. Having acknowledged the influence of Arthur Jafa on his work, Rashid uses music to drive his cinematic soundscape mashing multiple genres together. This is brought to a climax with a beautiful synchronisation between a distorted bollywood song ‘Dum Maaro Dum’ from Hare Krishna Hare Ram (1971) and the demise of Prince Naseem against Barrera. There is a definite evocation of the end of Naseem’s reign as the end of mainstream recognition, and the end of any straightforward sovereign narrative. The problem of Asian culture, as Rashid presents us with, is also the problem of masculinity highlighted by the fetishisation of Naseem’s body throughout the film. The Prince’s body failing as distorted climax signifies the end of any dominant Asian narrative. However the use of music as a central narrative force seeks to reproduce a culture that is not nostalgic, but rather one that is politically and aesthetically critical. Music as the documenting tool of history leaves it always open to contemporary social and artistic reinterpretations. This avoids a staid representation that often gets nostalgically retold, particularly in British Asian culture, in favour of something generative and open. For my first blog post proper I’m posting a few quick notes on Lotic’s new album Power. This may be the start of a series of shorter reviews/sketches/notes. Let’s see. Following Lotic’s work you’re struck by the movement of desire, and the uncoercive rearrangement thereof (Spivak, 2012); in a permeable drive entangled with identity, though not reducible to it. Angular, disjointed, their latest offering Power certainly continues in their strain of electronic music, though there is a softer vulnerability elicited in the opener ‘Love and Light’. 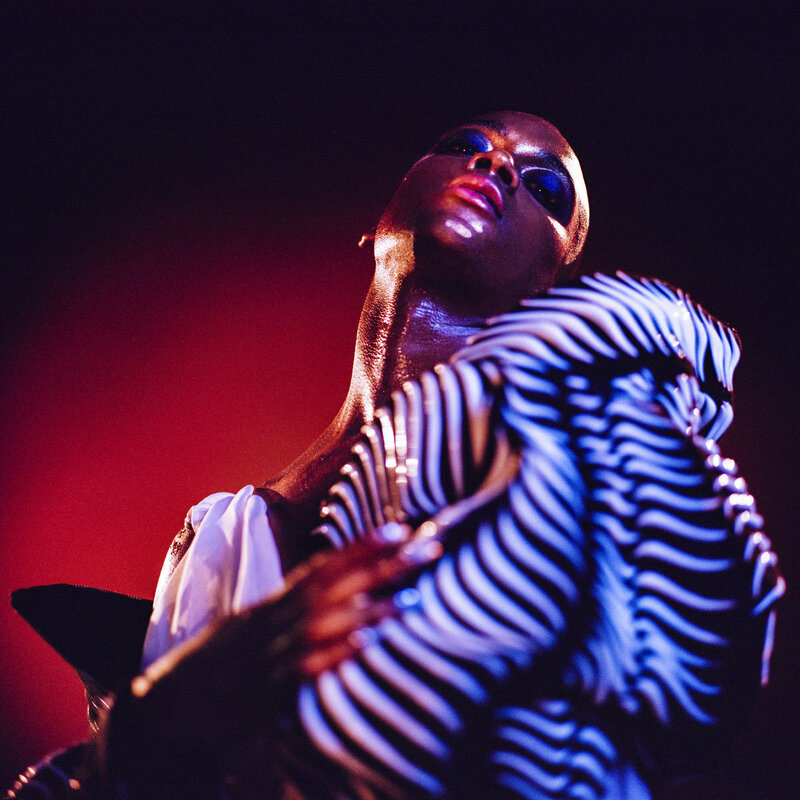 Lotic’s entry of their voice lends itself to a greater intensity of violence and vulnerability, something which Arca has also been developing in parallel. ‘Hunted’ in its whispering undertone, ‘Heart’ wispy and bare, ‘Nerve’ willful. The voice adds to this stillness and knowingness played through in the instrumental title track ‘Power’, a kind of out-of-placeness pre-loaded breaking-down in ‘The Warp and the Weft’. An instrumentalisation of the reanimated ‘phantom limb’, as writer Wilson Harris has formulated. And yet Power enters an architectural metaphorical spacing that inhabits Lotic’s interplay between audio mix, club performance and track-driven timing. This contributes to an aesthetic environment overlaid between the cinematic and visceral. The overlaying I understand as a kind of response and refraction of the overdetermination of space and time of the contemporary. While this is clearly in conflict with racialisation and gendering, the affective drive found, for instance, in the crackled horns ‘Resilience’ generates this aesthetic mapping of desire for something like freedom, or just the inhabitation of space itself. This resonates with the haunted motion of closer ‘Solace’, the closing of work-done. Its signifying-power epitomised in the double-image of the cover portrait. The double-play of visage/image eliciting a synaesthetic ‘phonic materiality’ (Fred Moten, 2003), a stylisation of form overlaying the movement of desire.